I feel very Dickensian. The Ghost of Digging Past is just about bearable. The Ghost of Digging Present is showing me horrible things. And quite often (ie now) the Ghost of Digging Future makes me want to lie down and cry. Just doing the bottom boundary path has taken me more than 6 hours. Lionel lent me a riddle to sieve some of the worst stones out of the dug bits. That man is kindness personified. 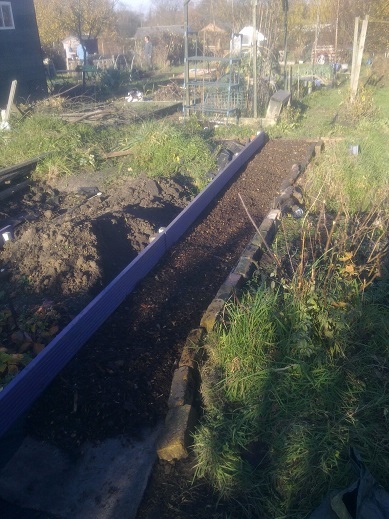 But I changed my mind about using the soil after I a) smelled it, and b) looked properly at the weeds to soil ratio. I am instead stashing barrow loads of weedy, stoney yuk either into the hedge or on top of the pile that the last work party scraped off the car park. That pile’s so huge my additions aren’t noticeable. Though successfully running a loaded barrow up a plank to the top is not yet something I do well/consistently. Our Chair said, in all seriousness, ‘someone might want to use that topsoil on their plot’. I stifled snorts and looked carefully at my boots. I know how much horseradish, couch, thistle, bramble and dock root there is lurking in there…not to mention the stones. 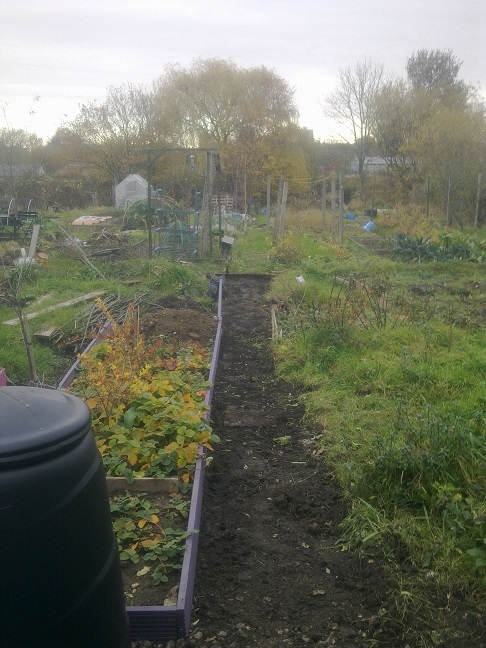 My friend Michelle says to break the digging down into chunks so … I reckon I should try to gradually dig and woodchip the paths plus the culticave area over winter. AND mark out and cover the beds-to-be. I’ve ordered a 50m roll of heavy-duty weed stuff from fleabay which should hopefully see me through all the remaining paths. (I wish I’d overcome my auction-site technophobia earlier – it would have saved me a fair bit of cash on shoddy weed fabric. ) That should take me to about March/April, unless I can draft in helpers. Through both Springs I’ve had the plot the beds aren’t really diggable till May. One of my neighbours has given up – she had the plot below mine, which is riddled with horsetail. The Chair offered to remeasure both the plots to ensure we have a 50-50 split. But given my speed at digging and looking at what is growing in what would potentially be gifted to me, I think I’d rather tackle what I have and sit on the plot waiting list to get another half plot a few more years down the line.